Geography is scoring: If you maintain the essence of Geography in your answers, it will definitely fetch you good marks in Mains. Geography is interesting: You will have a fun ride with geography as most of the concepts relate to the physical and social environment of which you are an integral part. 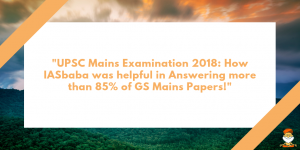 Geography has maximum overlap with GS syllabus: If you prepare Geography optional, more than 30-40% of your GS syllabus is automatically prepared. Moreover, you develop better perspectives for Essay paper and interview as well. Geography is logic driven and scientific: Unlike some other humanities subjects, the study of Geography entails logic, scientific theories, and empirical evidence. This makes Geography easy to understand and apply. Geography has an abundance of sources to refer to: There is no dearth of quality materials and good books in Geography. You don’t have to dig too much into bookstores to find good books on Geography. 2) IASbaba is ready to help you in your preparation of Geography. YES! We are launching full-time offline classroom programme for Geography optional in Bengaluru. Now you get the quality of IASbaba’s guidance in your optional too! It will be a classroom-based program spanning 3 to 4 months. In a week, the total number of classroom sessions conducted will be 6. Each session will be for 3 hours. Classes will be conducted on 4 days. Each session will comprise of intensive conceptual learning, discussion on previous year questions, quizzes, discussions etc. Master the technique of using the 6 tools of Geography to score really high in Mains. Value-add notes and synopsis on selected topics. Interested students can fill up the registration form. Once registered you will get an invite, with the payment link. Once the payment is done, send the acknowledgment to offline@iasbaba.com. This confirms your enrolment to the program. (OR) You can directly come to the office and make the payment and confirm your admission. The Office address is mentioned @ the end of the post.